Our skin is the most important and main organ ,it is also the only organ that takes a lot of abuse and ignorance and as a result we look ten years older than our actual age. When I was growing up my mom helped me a lot on how to take care of my skin. Keeping it clean, exfoliating it and using less chemicals .....I followed all and I am glad all her efforts and suggestions paid off!! Dark circles under the eyes, sometimes called shadows or dark rings under the eyes, are the appearance of dark skin between the lower eyelid and the top of the cheek. I know that taking care of my skin goes beyond just the products I slather on. Many of the lifestyle choices I make every day can have a significant effect on how my skin looks and feels. but the best way to help slow the hands of time on my face that really makes a difference is to use a cream that helps diminish aging signs. For me the biggest factor is Dark circles. There are hundreds of skincare products that claim to reduce dark circles,but do they really work?? Luckily I got chance to try a new cream By BodyMerry. 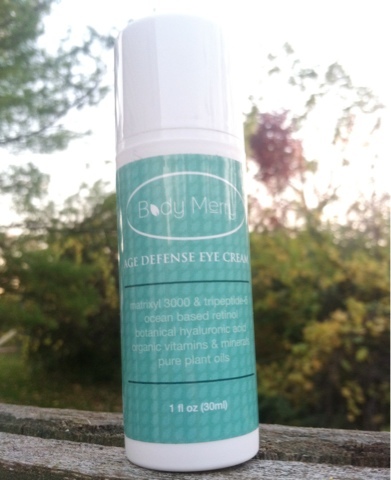 Body Merry Age Defense Eye Cream is a comprehensive solution for all eye concerns – whether its dark circles, wrinkles, puffiness, crow's feet, fine lines, dryness, sags or bags. The cream itself is very light and absorbs quickly leaving eye area nicely moisturised. I noticed my dark circles becoming lighter and lighter by every day and fine lines around my eye area have almost diminished. It contains an impressive mix of proven hydrating ingredients like Jojoba Oil,beeswax, Cocoa butter. It is made in USA and has not been tested on animals. In conclusion this is a pretty good eye cream. 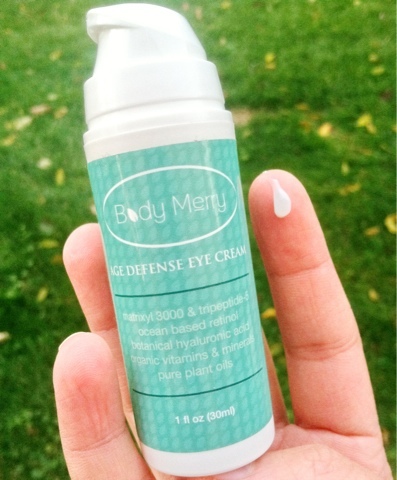 I noticed a big effect on fine lines, it made my under eye area look lighter and I liked that Body Merry Age Defense Eye Cream absorbs quickly leaving my eye area moisturised. It is difficult to get an eye product that looks as though it works...but this one really does seem to do a good job..
Would I purchase it again?Yes of course. Do you want your eyes to express everything but your age? This cream is perfect for your eyes since we reject the idea of using harsh chemicals for the delicate eye area and use natural and organic ingredients instead.We've packed in cutting edge peptides like Matrixyl-3000 and Tripeptide-5 with an ocean based Retinol and botanical Hyaluronic Acid. We know that's not enough – so we've added lots of antioxidants, organic vitamins and minerals, pure plant oils and botanical actives – Aloe, Witch Hazel, Coconut Oil, Cocoa Butter, Vitamin C, Cucumber, Beeswax, Jojoba Oil, Tamanu Oil, Green Tea, Licorice, Eyebright, Avocado Oil, Flax Seed Oil, Rose Hip Oil, Lemon, Lemongrass, Vitamin B5, Lavender and Chamomile (to name just a few! ).Our cream works well on all skin types and leaves your skin looking and feeling firm, plump and young. Get fast and lasting results and be at the receiving end of compliments! Look Younger Than You Are With Our Revolutionary Age Defense Eye Cream! ~ You're saying NO to sticky creams that burn and leave your skin itchy and dry; ~ You want a cream that doesn't give itself away under make up; ~ All you want is a Guaranteed solution for all your eye woes, whether its dark circles, wrinkles, puffiness, crow's feet, fine lines, sags or bags. ~ We reject the idea of using harsh chemicals for the delicate eye area and use natural & organic ingredients instead; ~ We've packed in Vitamins C+E+B5, Peptides, Retinol and Hyaluronic Acid; ~ We know that's not enough. So we've added Antioxidants, Minerals and Plant Oils: Aloe, Witch Hazel, Cucumber, Jojoba Oil, Green Tea, Licorice, Eyebright, Avocado Oil and Rose Hip Oil (to name just a few! ); ~ Our cream works well on all skin types and leaves your skin looking and feeling firm, plump and young; ~ You can get effective and lasting results and be at the receiving end of compliments! Clean and completely dry your skin before use. A tiny amount (smaller than even a pea sized dollop) is sufficient for both eyes, so take it easy until you find the quantity that works best for you. Use your finger to dab the cream along the contours of your eyes. This is the area under the eyes to the cheekbones, at the outer corners and underneath the brows. Use on eyelids as well. This helps to keep droopy lids at bay. If crow's feet are a concern, ensure that you get the cream into the crevices at the corners. Move in a circular fashion, and don't press too hard. The skin around your eyes is extremely sensitive so be gentle! You can also use the cream as an all over face and neck moisturizer as well as on your hands, to slow the signs of aging. For best results, use twice daily (morning and night). Given that any product of this nature needs some time to fight signs of years of aging, we recommend that you give it at least 5-6 weeks to show you what it is truly capable of. I am always looking for a good eye cream. I will have to try this out.